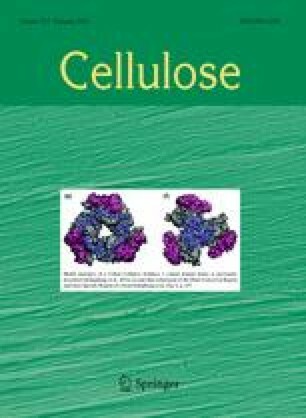 All-cellulose nanocomposites reinforced by cellulose nanocrystals (CNC) were produced using a solvent consisting of 1-butyl-3-methylimidazolium chloride and dimethyl sulfoxide. Microcrystalline cellulose (MCC) was pre-dissolved at high temperature in the solvent. Freeze-dried CNC were then added to the slurry at room temperature, thereby avoiding complete CNC dissolution. Solid all-cellulose composite films were obtained by film casting, solvent exchange and drying. The MCC to CNC ratio was kept constant while the solvent content was incremented. The short-range and long-range cellulose–cellulose interactions in the solid materials were respectively assessed by Fourier-transform infrared spectroscopy and X-ray diffraction. The CNC used in this work contained both cellulose I and cellulose II. The cellulose concentration in the mixture drastically changed the overall crystallinity as well as the cellulose I to cellulose II ratio in the ACC. Cellulose II was formed by recrystallisation of the dissolved fractions. These fractions include the pre-dissolved MCC and the cellulose II portion of the CNC. Cocrystallisation with the cellulose I CNC acting as a template was also evidenced. This phenomenon was controlled by the initial solvent content. The correlation between the hygromechanical properties and the nanostructure features of the ACC was investigated by humidity-controlled dynamic mechanical analysis (RH-DMA). The introduction of the cocrystallisation and percolation concepts provided a thorough explanation for the humidity dependency of the storage modulus. The online version of this article (doi: 10.1007/s10570-015-0805-x) contains supplementary material, which is available to authorized users. The authors would like to thank Emilie Perrin (BIA) for her help with the TEM. Financial support from the CNRS was provided through a PEPS grant (BioMIMCellwalL). BD would like to dedicate this article to the memory of the late Dr Roger H. Newman.